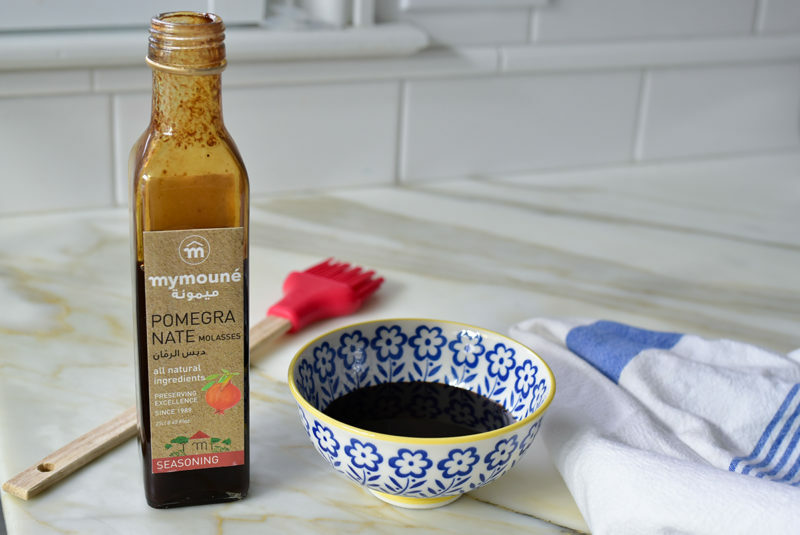 Pomegranate glazed leg of lamb gets its tremendous flavor from a short marinade, then a glaze of sweet-tart pomegranate molasses toward the end of roasting. This lamb recipe is absolutely made for special occasions like Easter. 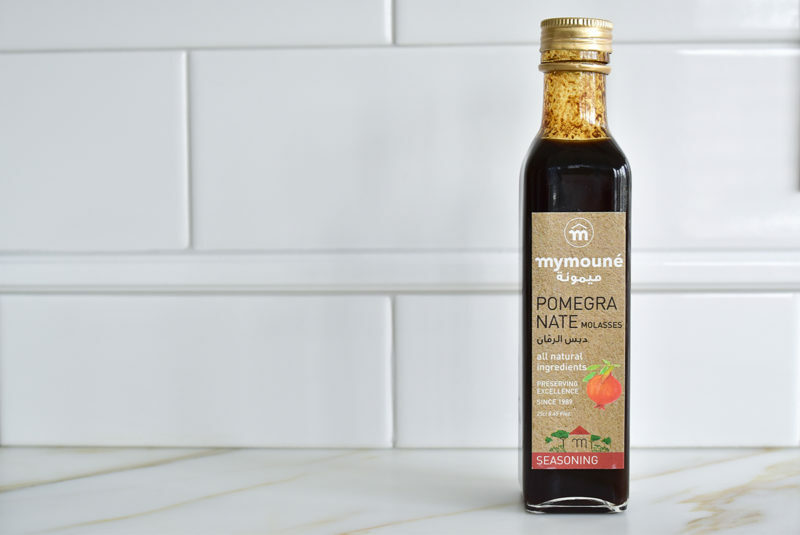 The pomegranate glaze lends a glisten to the lamb, worthy of carving at the table for all to see. My family will correct me if I’m wrong (right?! ), but I speak the truth when I say that I don’t think we ever had a big, roasted, whole leg of lamb on the table growing up. Lamb chops, sure. Little lamb popsicles, some. Lamb shish kebab (a.k.a. laham meshweh), oftener than often. Our kibbeh has been, is now, and ever shall be made with not lamb, but beef. I’ve taken some heat for this from peoples here and there. Pretty sure the beef kibbeh came about because we didn’t have great access to great lamb in 1970s Lansing, Michigan. But I think there’s another clear reason why we didn’t have the big roasted leg of lamb at home. We couldn’t eat leg of lamb whole, roasted, because then my dad wouldn’t have gotten to butcher the bigger cut of meat into smaller chunks. My father was the master of the knife and any large cut of red meat. He practiced his trade at the kitchen island. His own father, my jiddo Salim Abood, was a butcher in their family corner grocery (how many of you share this same story?!). 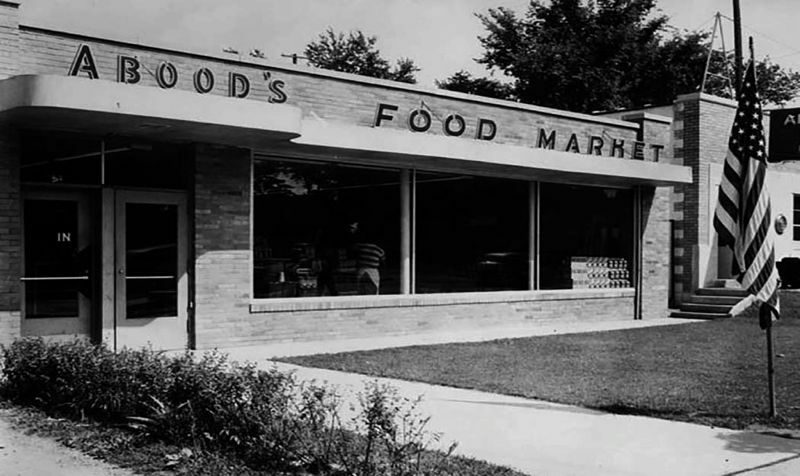 At Aboods Foods circa 1940s and 50s, Dad was expected to work hard, work often, and do what he was told–so much so that he didn’t tell his parents when there was a day off of school so that he could go to his friends’ houses rather than work. He got always got caught and sent right back to the grocery, you can believe that. 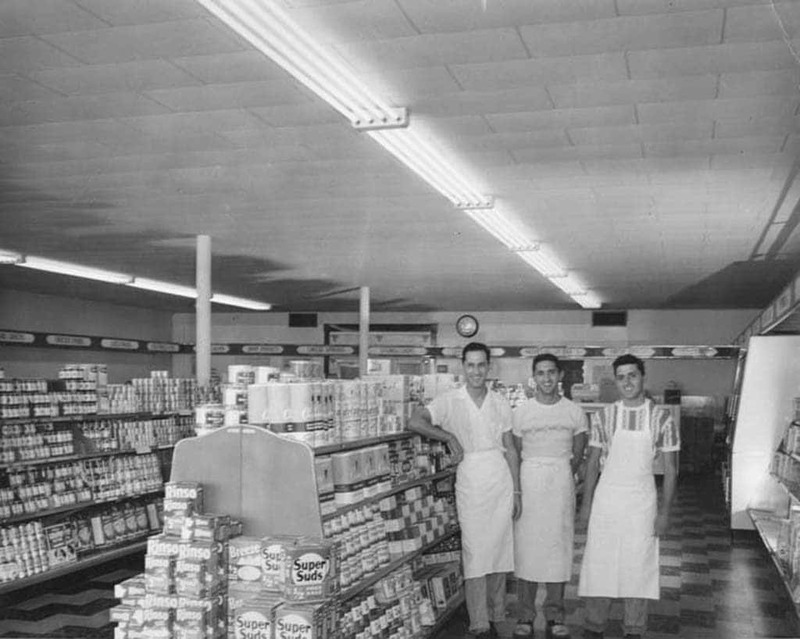 So while my dad wanted nothing more than to get out of that grocery, and despite the fact that he and his brothers were pushed into the strength and gift of education and post-graduate education (the sisters, not so much—a painful and not uncommon part of our history), my dad nonetheless considered himself a butcher of sorts. He couldn’t not cut up any leg of lamb into 1- to 2-inch pieces for laham meshweh. He couldn’t not roll up his white shirt sleeves above his elbows and wash like a surgeon at the kitchen sink, holding his hands up as he turned to the island. Mom knew, like a good surgical nurse (but one who was, in actuality, in charge), to hand him the sharp chef’s knife. The process of cutting up his raw meat was as delightful to him as the final result, when he would take a small piece, salt it good, and wrap it up in a big, soft, chewy piece of flatbread. He couldn’t not savor every bite of that Lebanese-style tartare. It is true that this memory is so beautifully persistent and strong for me that I can hardly roast a leg of lamb whole. I want to remember dad by repeating his steps, right down to the savory raw bite. But I don’t have Sitto’s flatbread (I’m working on it, people! ), and when we recently came into an abundance of incredibly good fresh, local lamb, our freezer was home to not one but two gorgeous leg of lamb roasts, along with a king’s ransom in chops and racks—well, I knew I could have it all. One leg of lamb I could cut up Dad-style for shish kebab. Another I could roast with a flavor not unlike the legendary lamb shoulder at Zahav in Philadelphia. That’s a celebratory lamb we had at the finale of the photo shoot for my cookbook, and it has happily haunted me ever since with its rich sweet-tart pomegranate glaze and deep infusion of aromatic flavor. Chef Solomonov’s restaurant process on the lamb shoulder is doable, but lengthy (3 days…). I wanted his flavors, but with a leg rather than shoulder. 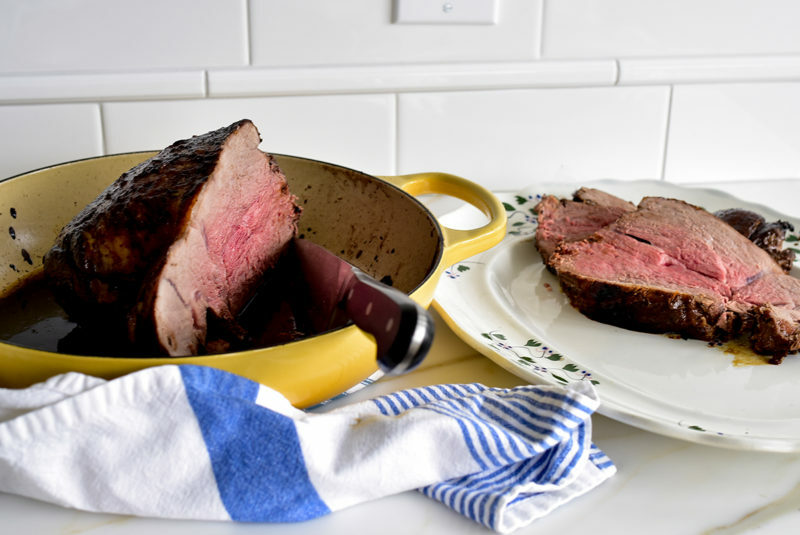 Leg of lamb is like beef tenderloin: it is tender and more delicate. 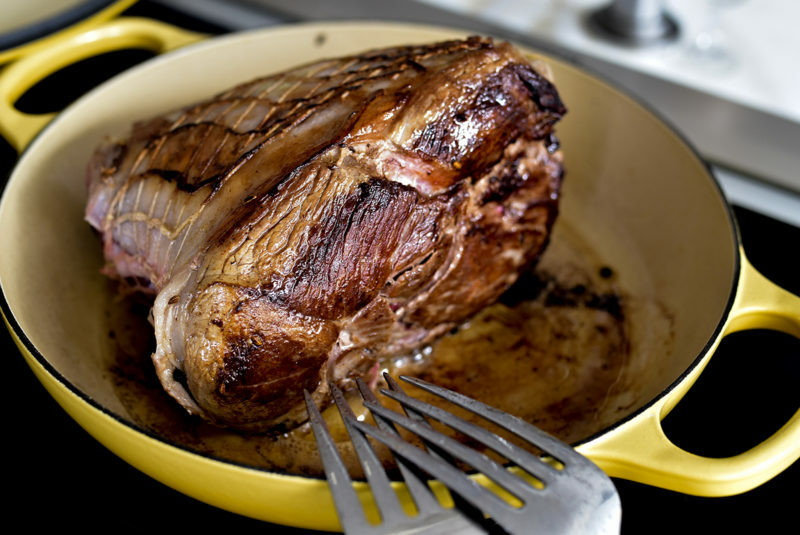 Lamb shoulder, of course, is the tougher cut that braises long and slow to a caramelized, meltingly soft and rich experience. Here we have a (briefly) marinated whole, tied leg of lamb, seared on the stove before baking (splatter warning! Resist the urge to do this in your Easter finery!). The lamb is then glazed toward the end of roasting (to prevent burned shellac) with pomegranate molasses. Oh Daddio! I’m not going to say that for this incredible roasted lamb, my dad would have given up his cheffy/butcher/surgeon moments at the kitchen island, or his salted raw lamb bites in the bread. But yes, absolutely yes, Dad would make sure he found two legs of lamb, like I did, so he could have it all. I like to cook the lamb on the medium-rare to rare side for tenderness. 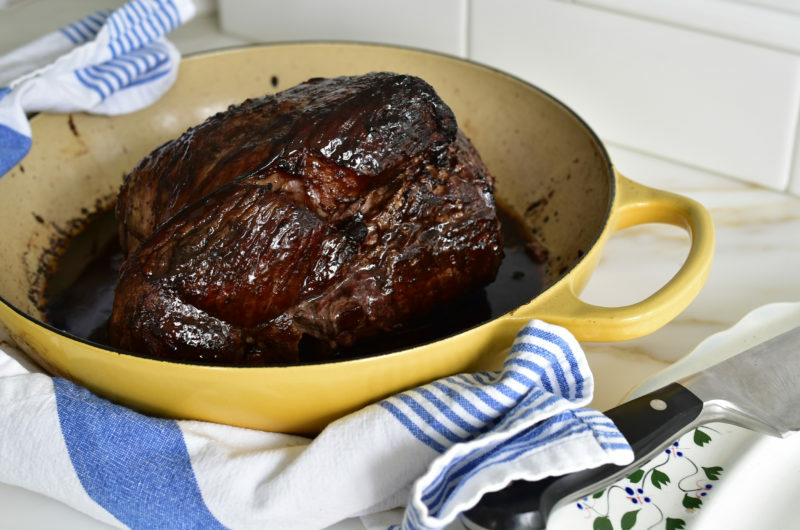 Total roasting time is approximately 10-15 minutes per pound, so plan on just over an hour to an hour and a half in the oven--longer if you're using a bone-in leg of lamb. Leg of lamb is best with a shorter marinade time, so marinade for just a couple of hours before roasting. Or, marinate the meat a day in advance for a couple of hours, remove the lamb and dry it off, then chill in the refrigerator for up to a day before roasting. You could also sear the meat in advance, then chill until ready to roast. The searing of the meat splatters a good bit, so you’ll want to avoid wearing your Sunday best while cooking this! 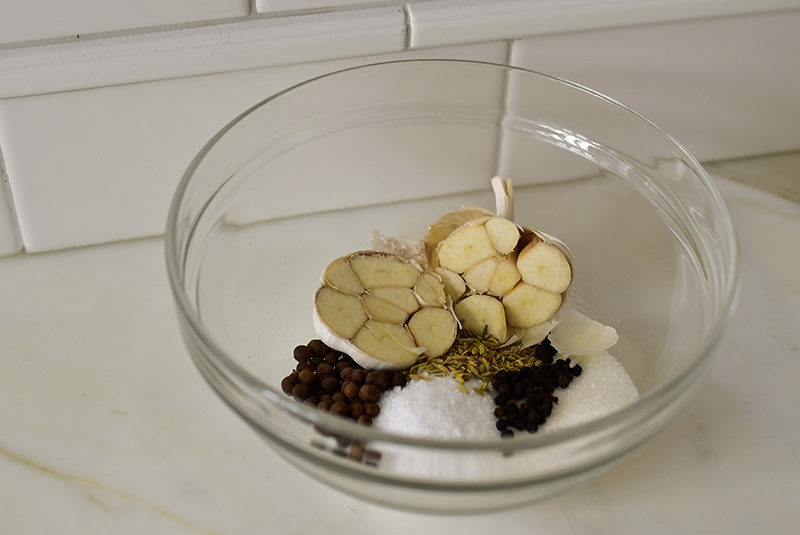 Here we're using Michael Solomonov's perfect marinade that he uses for his famous lamb shoulder. 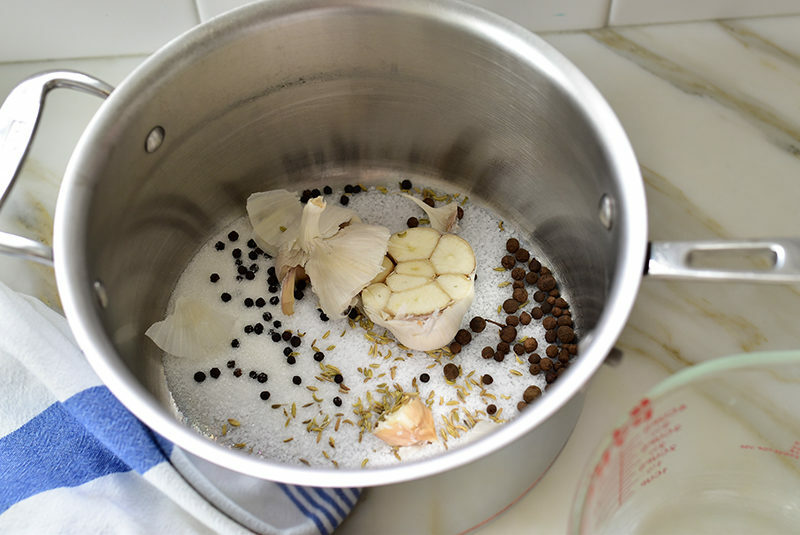 In a large bowl or saucepan (I use a saucepan because it’s narrow enough to immerse the entire leg of lamb in the marinade), combine the salt, sugar, fennel seed, peppercorns, allspice berries, and garlic with the water. Stir occasionally until the salt and sugar are dissolved, about five minutes. 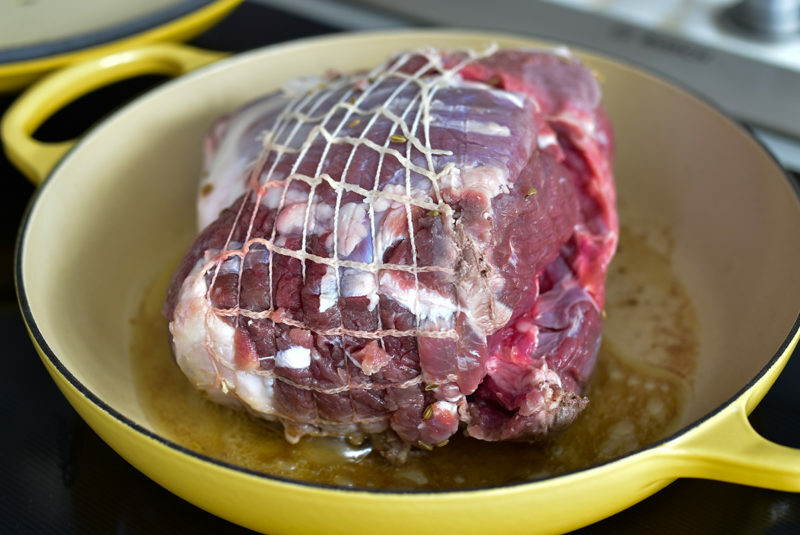 Immerse the lamb in the marinade and marinate for 2- to 3 hours, refrigerated. Adjust the oven rack to the lower third of the oven, and heat the oven to 375 degrees. Remove the lamb from the marinade and pat it dry with paper towel, removing any whole spices that may be lodged around the exterior of the lamb. In an oven-safe low-sided roasting or sauté pan (such as Le Creuset), heat the butter and oil over medium high heat until very hot, about 3 minutes. Sear the lamb on all sides until the fat and exterior is caramelized and deep golden brown, about 4 minutes per side. Transfer the pan with the lamb to the oven, and roast until a thermometer inserted into the center reads about 110 degrees. 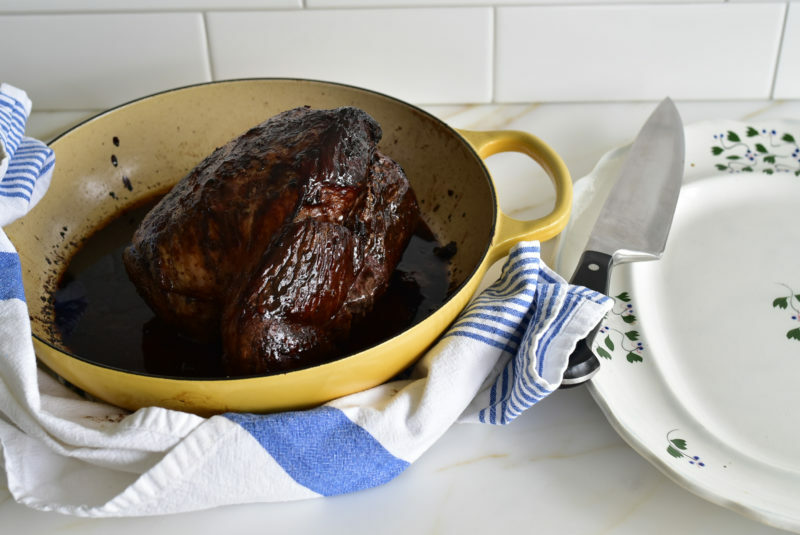 Take the pan out of the oven and brush the exterior of the lamb with pomegranate molasses. Return the pan to the oven and continue roasting until a thermometer inserted into the center reads about 125-130 degrees, for medium rare. Remove the pan from the oven and brush the lamb again with pomegranate molasses. Let the lamb rest until you are ready to slice and serve it, either warm (within 30 minutes) or at room temperature (up to an hour). Be sure to remove and discard the string before slicing. 9 Responses to "Pomegranate Glazed Leg of Lamb"
Hi Maureen, I love your recipes and I love your stories. My Jiddo, Khalil Eblen Yazbek came to South Africa many many years ago, and as he couldn’t read nor write English we were registered as Kaplen. He married a South African woman (Afrikaner), and went back to Lebanon. There my gran learnt how to cook Lebanese food and also how to speak and write Arabic. My Father was born there. They came back to SA along with his youngest brother and his cousin. (His cousin was a Abood. (spelt here Aboud) and many delicious recipes. I told my sister (she lives in the US) about your blog, and she immediately bought your book (which (between you and me 🙂 ) created some jealousy inside of me! So, who knows maybe somewhere, somehow, we may even be very distant cousins! Thanks for the blog, thanks for your stories, and thanks for delicious Lebanese recipes. Revien, my cousin! How special to know your story and our connections and our shared name. I hope your sister will be in touch, and that you will keep me posted on all that you are cooking and baking Lebanese. Thanks so much for writing! You have the gift of inspiring others to share stories that weave memories, anew. and accompanying stories are heartfelt. Blessed Easter Elaine, and thank you for such kind and generous words. This looks amazing! I’m planning to make it for Easter. Any suggestions about what to serve it with? Thanks! Wonderful Liz–I serve this with My Mom’s Special Rice (get the recipe here), and pistachio asparagus (here), plus always fattoush (here) and Garlic Butter Glazed Talami (here). You can poke around my site in the recipes section here for much much more! Blessed Easter to you and yours! I’m the proud owner of a new BBQ. Could you grill this lamb roast with the top down on the BBQ, in order to roast it? Yes! Just keep an eye on the temperature of the meat so it doesn’t overcook. Ellen, you could grill with the top down, just keep taking the temperature to be sure the lamb isn’t overcooked (135 degrees for medium rare).